The "ostrich" /1/ of Southern Patagonia is really misnamed: it is a different species (Rhea pennata or Darwin's rhea). This flightless bird has appeared in the accounts of Patagonia's visitors from the first known explorers up till the present day. Its history symbolizes the impact of encroaching "civilization" in the New World, and it is intricately bound up with two familiar phenomena: the disappearance of indigenous peoples and the overexploitation of natural resources. This brief anthology offers a sampling of those travellers' first-hand tales, written over a wide period of time. The earliest Europeans touching the coastal zone of southern Patagonia, such as Magellan, Loaisa, and Drake encountered the Tehuelches, nomadic hunters for whom the ostrich supplied meat, plus feathers for personal adornment. Assisted by dogs, these natives stalked their quarry on foot using bow and arrow, and boleadoras. Soon after Spain introduced the horse to South America, some animals escaped into the wild. These spread southward through the continent so that, by the 18th century, it had been adopted by the Patagonian natives. As in Eurasia centuries earlier, the horse was a powerful enabler. 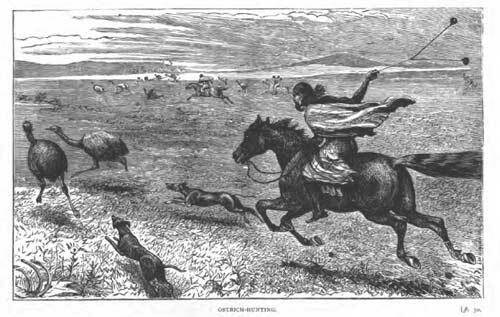 It gave the Tehuelche greater mobility, for migration and for hunting; guanaco and ostrich were captured more efficiently with boleadoras alone (see illustration above). The bow and arrow gradually became less used after this time. During the 19th century, a small number of Westerners had the opportunity to record the native customs for posterity. Some of these observers were voluntary companions: Arms & Coan /2/ made an unsuccessful attempt to establish a missionary presence; while Musters (whose motives are sometimes questioned) seems to have been motivated by curiosity and a sense of adventure. Bourne, on the other hand, was a prisoner, and closely guarded — he was obliged for his own survival to adopt the native diet and mode of travel, in hopes of finding an opportunity to escape, or being exchanged for ransom. Transition phase: Trade with the "Cristianos"
Under Spanish colonial rule there was some organized trading further north, in the River Plate region, supplying Patagonian feathers for the European market. By the early 19th century, passing ships (such as British and North American whalers and sealers, who frequented San Gregorio Bay in the Strait of Magellan) operated a barter system, exchanging local hides for simple manufactured goods, trinkets, tobacco and alcohol (typically, rum and aguardiente). According to Macdouall /3/ and Bourne /4/, there was initially little interest on either side in trading ostrich feathers, while Arms & Coan made no mention of it. In 1843, Chile established a permanent presence in the Magellan Strait (first Fuerte Bulnes; five years later Punta Arenas); and in 1859, the Argentine Luis Piedrabuena founded a trading post at Isla Pavón, near the Santa Cruz estuary (Musters). Both nations' governments saw the political value of engaging the loyalty of the Tehuelches. These settlements transformed the casual contacts with ships' crews into an established routine, providing a better market for the main native products (furs and feathers). By 1867, the Chilean governor considered ostrich feathers as one of the local products worthy of representing the colony in an international trade fair	(Riobó). In the feather trade, western commercial calculations (aka short-term gain) prevailed. Ostrich feathers were exported in bulk — over two tons from Punta Arenas alone in 1884 (Bertrand). Feather rugs were sought after for their softness: but the ecological price was high — each one cost the lives of a dozen or more young birds (NY Sun), upsetting natural reproduction. Until the end of World War I, dealers in Punta Arenas enjoyed a large local trade with passengers of ocean-going ships (Spears ; Skottsberg ; NY Sun). By this time, handcrafts were more likely to be made in town than out on the pampas. In summary, unmanaged exploitation meant that the Patagonian ostrich population dwindled alarmingly, as Payró had predicted. Once the Panama Canal entered service in 1914, the volume of ships passing through the Strait of Magellan fell, and Punta Arenas' economic activity declined. Moreover, fashions in clothing changed, and demand for feathers slumped. These factors have allowed the species to recover: it is now no longer in danger of extinction. /1/ In Argentina, the species is popularly known as "choique"; in Chile, as "ñandú". /3/ (1827) Macdouall, reporting Fitzroy's contact with natives at San Gregorio, states "The beach was now thronged by [...] from three to four hundred people. They were evidently assembled for the purpose of barter, for an innumerable quantity of ostrich feathers (of no value), skins of the guanacoe, and other animals were laid out upon the stubble, as if for inspection." /4/ (1849) Bourne, taken prisoner at the Strait, reports "It was noticeable that the plumage of the ostrich, though beautiful, was not valued by the Indians; large quantities of the feathers are blown all over the country, without attracting the least regard ..."
/5/ By the 1880s, the introduction of large-scale sheep ranching supplied the coup de grace for the Tehuelches. With the private ownership of land and subsequent fencing, their way of life was destroyed. Sadly, many of them died — culturally disoriented, dispossessed and ruined by disease and alcoholism.